Earlier this year I created a simple vSphere SDK for Perl script that allows you to update ESXi's DCUI (Direct Console User Interface) banner with multiple lines of text. I originally thought you could not customize the text color or the background color, though recently I found out that was not the case. 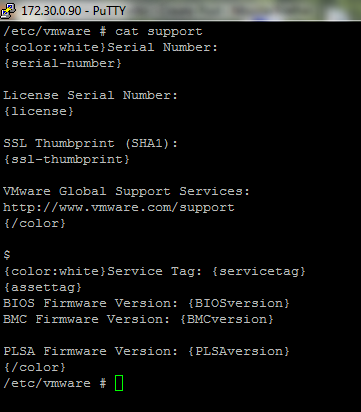 While doing some testing on ESXi 4.1, I noticed two files (support,welcome) located under /etc/vmware and looking at the contents of support, it made realize we might be able to change the colors. I decided to use one of my favorite UNIX utility, "strings" to take at the dcui binary that is located under /sbin in the Busybox Console (Tech Support Mode) and discovered you can control both the font color and background color. There are also special variables that can be used to display information about the ESXi host such as the product version or IP Address. There are two ways of updating the DCUI welcome banner: using local or remote esxcfg-advcfg or manually editing /etc/vmware/welcome file. As you can see, this is not easy if you want to update multiple lines. You would need to add a lot more spaces to force newlines, but this becomes tedious and pretty much unreadable. The second method is edit the welcome file that is located in the Busybox Console, which requires you to enable ESXi's Tech Support Mode. I wrote a quick Perl script called generateDCUIScreen.pl which accepts an input file and allows a user to customize the output and the script generates the "welcome" file which is uploaded to your ESXi host. The script requires that you have Perl, but you do not need to have vSphere SDK for Perl. For ease of use, I executed the script using vMA. This will kill dcui utility and watchdog process will spawn a new instance causing the change to take effect Note: A reboot will also do the job, but be sure to run /sbin/auto-backup.sh before doing so, that way the change will be backed up. As you can see, you can control variety of pre-defined variables including hostname and IP Address and custom text for your organization. This is useful for those that do not want to expose all the information that available on the default DCUI screen, which may be a security concern for some organizations. A few things to note, I was not able to fill the entire screen like the default DCUI banner and the "welcome" file is character sensitive and you need to use tabs or white spaces to force the background to get filled. There is also a limit in the number of characters per row before it wraps to the next line. 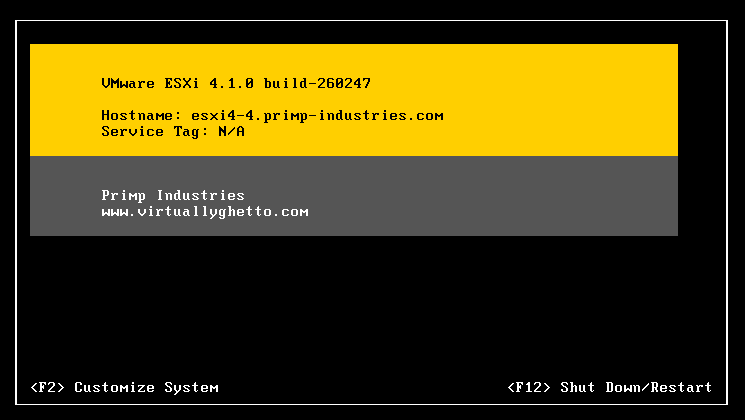 This can easily be integrated into a scripted install using the new ESXi 4.1 kickstart feature. That’s f’ing awesome. You can shove down some of the welcome screen data with host profiles too, I’d be interested to see if you can do some of the same customizations and blast them out with host profiles. Nice write up and sleuthing. H4x teh ESXi… nice dude. Sorry for the silly questions; learning as I go… How can i execute generateDCUIScreen.pl using rCLI? Could you elaborate on this statement: “You will need to scp the new “welcome” file to your ESXi host under /etc/vmware”. Am I supposed to replace the welcome file with the input file? I am trying to use this method but I find no dcui process .the /etc/vmware/welcome is updated ok.
thanks William , I have overlooked it. running on ESX host ? the esxcfg-advcfg -m option changes the /etc/vmware/welcome, but I guess it is not used by the “welcome screen ” here. do you know what is the keyword to display the cpu model and number of cpu model on the dcui. This would be similar to what shows up on the default dcui screen. Got around it by placing an init script that will generate ‘welcome’ everytime with cpu #s / model inserted ..
Nice! One question though. 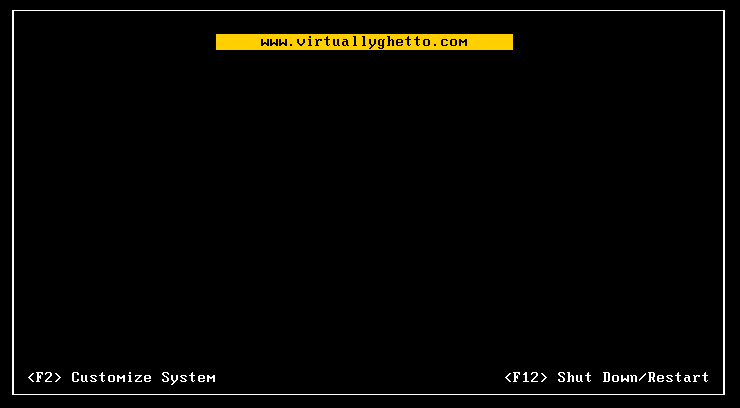 I have it in my kcikstarts and all works fine BUT when I ‘Enable Local Tech Support’ and go to the logon screen (Alt-F1) the text of the /etc/vmware/welcome file is displayed before the login prompt! And I mean the actual TEXT – not the translation. Also, I get the exact same behavior if I do it manually after the build is complete. i simply edited “welcome” file and successfully displayed. Then i removed the line now its showing blank screen. How can i get back default display ? Thanks for this post! I’ve combined stuff from your tutorial with a script that is run by cron every 5 minutes and gets the status of my guests using vim-cmd and outputs them to the screen. 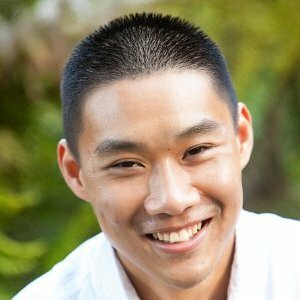 Are there any other variables that /etc/vmware/welcome will process? did you know the parameters for CPU model and quantity in welcome file?